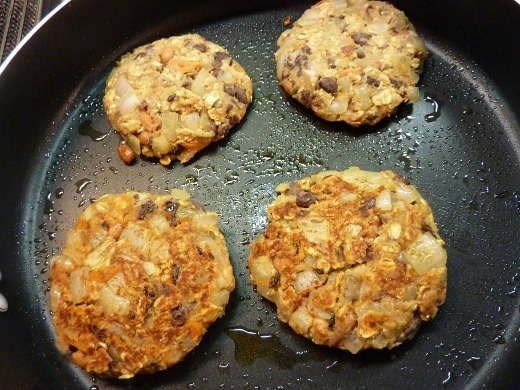 I am absolutely in love with this bean and veggie burger recipe!! Another great find from my Comfort Food Diet Cookbook. With the huz out of town for work for a few days this week, I whipped up a big batch of these burgers for solo dinners and lunches. 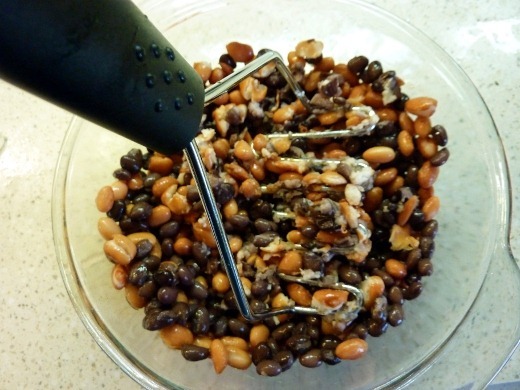 To begin, I mashed one can of pinto beans and one can of black beans, both of which were drained and rinsed. 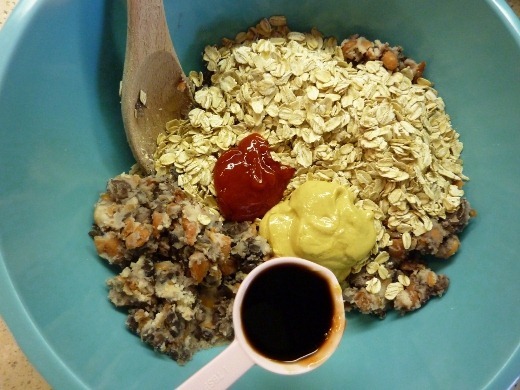 To the mashed beans, I added oats, Dijon mustard, ketchup, and soy sauce. 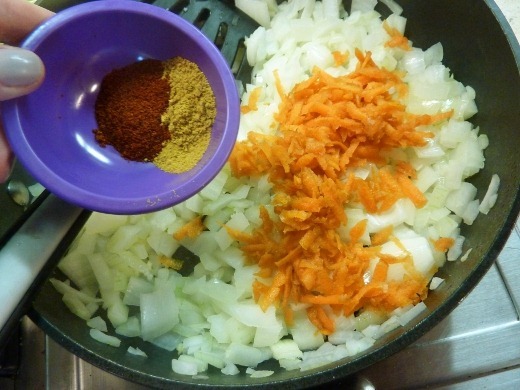 Meanwhile, I sautéed onion, garlic, and shredded carrot until soft, and then added one teaspoon of cumin and of chili powder. Next I added the sautéed veggies to the bean and oat mixture. 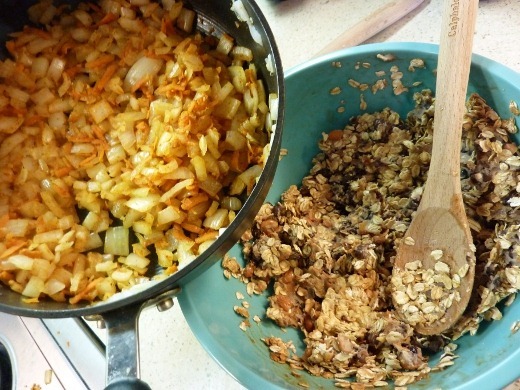 I quickly nixed the spoon and busted out my favorite kitchen tools – my hands! Gotta get down ‘n’ dirty, in this case. 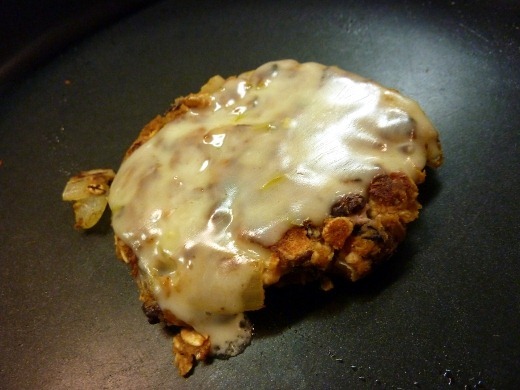 The recipe made eight patties, and suggests grilling or broiling the burgers, but I cooked mine in a skillet over medium-heat for several minutes on each side, until lightly browned. A little cheese never hurt anyone. 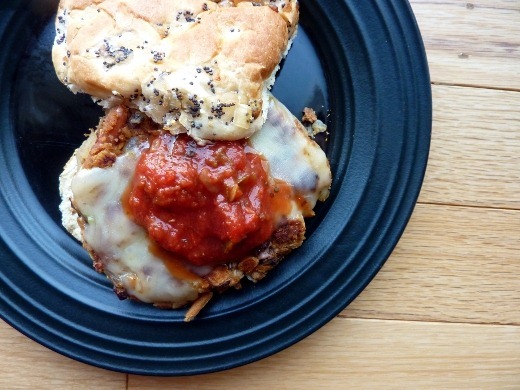 These are great with a big dollop of salsa on top! Bun optional. I ate one with a bun and for the rest I found no bun to be necessary. I cooked up all eight of mine in one evening, ate one, refrigerated three, and froze four. The three left in the fridge heated up very nicely either again on the stove or in the microwave for lunch (and dinner!) the next day. This is a fab recipe! So filling and so flavorful. Currently listening to: Seether – Country Song. Pingback: Falafel with Avocado Spread « Meg.Goes.Nom.Nom.